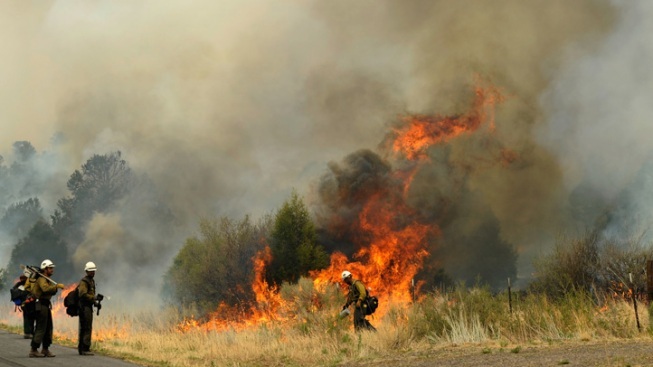 Firefighters set a backburn while battling a wildfire in Arizona. Authorities say six people have been treated and released after a Central Texas brush fire destroyed 15 mobile homes and more than a dozen vehicles. Texas Forest Service spokeswoman Lexi Maxwell said Tuesday that crews are working to contain the blaze that started with a 30-acre fire in Leander, about 20 miles northwest of Austin. Maxwell says authorities are trying to determine what started the fire Monday afternoon. Maxwell told The Associated Press that some of the heavy brush could burn for a week or two. The Leander Fire Department says two citizens required medical attention, along with four firefighters who suffered heat-related ailments. Dozens of evacuated residents were allowed to return to their homes Monday night.